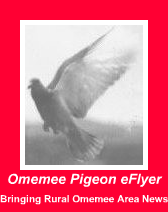 Omemee Pigeon eFlyer: Omemee Residents Fenelon Falls Bound New Years Day! January 1 2017 Omemee Residents and Visitors Invited to see Mayor in Fenelon Falls New Years Day! Kawartha Lakes Mayor Andy Latham invites you to Fenelon Falls for his 2017 New Years Day Levee. Celebrate the New Year at the Mayor’s New Year’s Levee between 1pm and 3pm at the Fenelon Falls Community Centre on January 1, 2017. The Community Centre is located at 27 Veterans Way, Fenelon Falls. “I look forward to welcoming residents to the Levee as we look back on all we have accomplished in 2016, and start the New Year together,” commented Mayor Andy Letham. Guests will be able to participate in an informal meet and greet with Mayor Andy Letham and enjoy light refreshments. Will you be attending the Mayors New Years Levee?